RSS and using the buttons to the right. 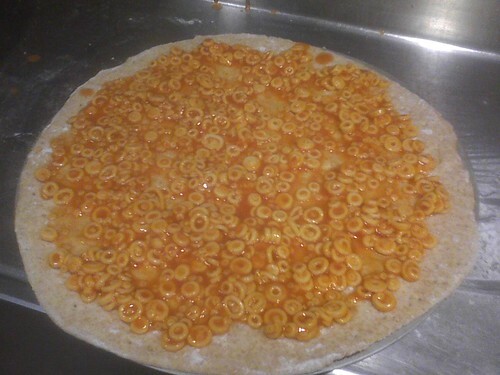 Yes, I'll actually be showing you a Spaghettio Pizza. First, here's bunch of random stuff I found on my SD card. Like tamales that Said gave me - out of the blue. 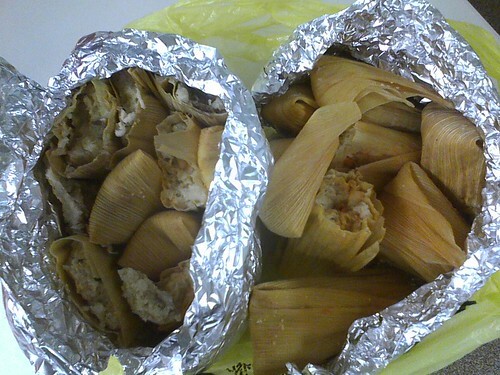 Is anyone else blessed with someone who just knocks on your office door and delivers homemade tamales?? Good stuff. Thanks, Said! 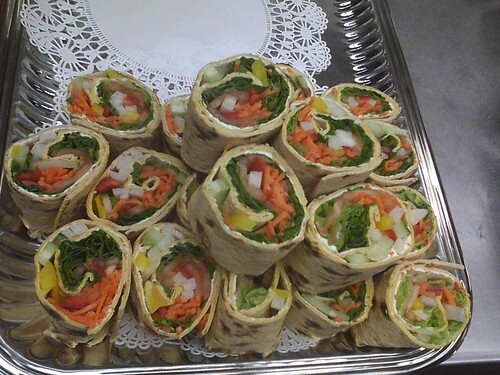 It's of a bunch of sandwich wraps that Tom made at work. Tom put them on the tray and they reminded me of sushi. So colorful and made with love. 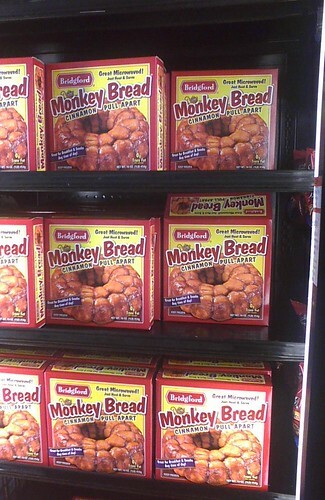 "Completely made without love - Monkeybread! There it is, it's Trans Fat Free. Well, now, I guess I want to buy that! We should all buy that! Moving along...to Grocery store Kim Chee. Wow, and there are PREMIUM veggies in that jar, baby! 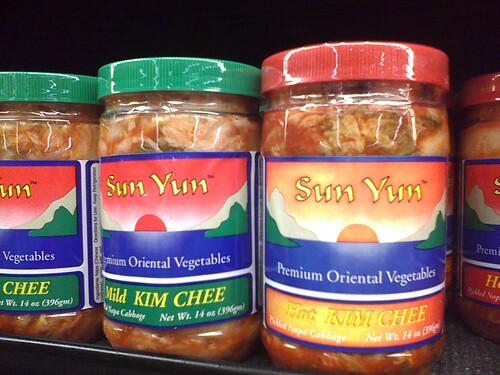 So, if you find yourself needing a late night fix of Kim Chee, it's only as far away as your local Jewel/Albertson's store! 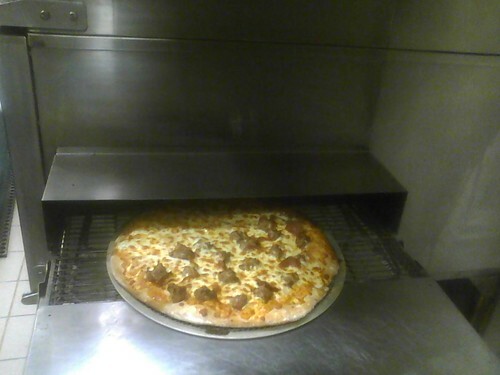 You see, I make specialty pizzas at work. Chicken alfredo with sun-dried tomatoes and fresh basil, Italian beef, meatball sub, mac and cheese. 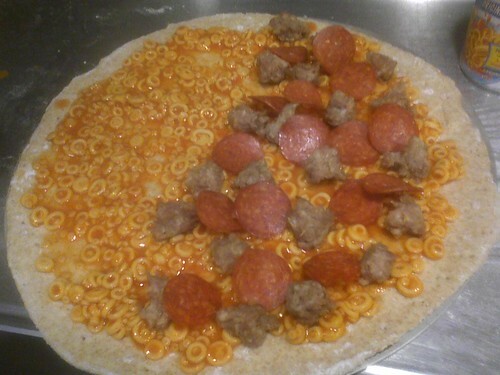 Lately the fabulous baker boys, Doug and Artie, have been on my case to make Cherrio - I mean, Spaghettio Pizza. I found as many excuses as I could, then finally said, "If you can get Scott to sign off on it, I'll do it." My manager, of course, said that if it will make them stop asking...do it. That's the, er, "traditional" (before cheese) sitting atop my hand-made honey whole week crust. Made with love. lol. 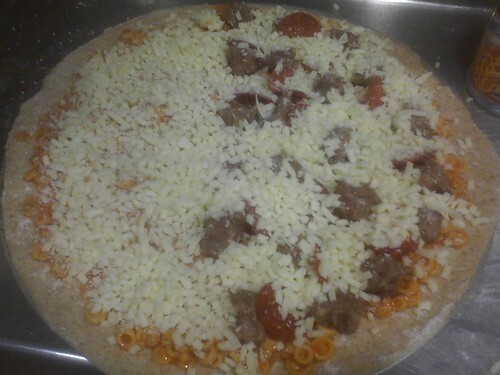 That's the, um, "Meat-lovers spaghettio pizza" sitting atop my hand-made...never mind. Our pizza oven, giving birth to the new creation. But, would it taste good? Well, it received 4 thumbs-up from Artie and Doug...and a 5 from the East German judge, tonight played by Bart. But, seriously folks...it wasn't horrible. It actually looked sorta, nice. And, it tasted, (yes, I tasted it) sorta...okay, bland. But, it looked pretty. Really pretty. 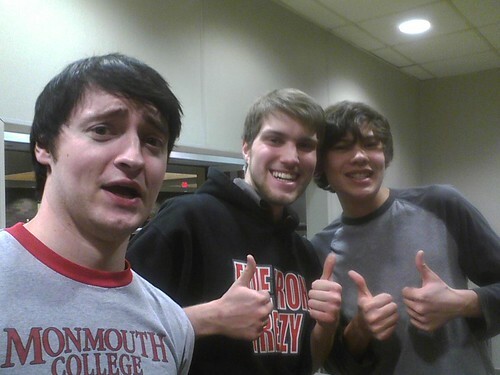 Now the fabulous baker boys want...a Krab (with a K) and cream cheese pizza. If you need me, I'll be reading Dr. Cloud's book on Boundaries. So, tell me, what would YOU put on YOUR pizza? 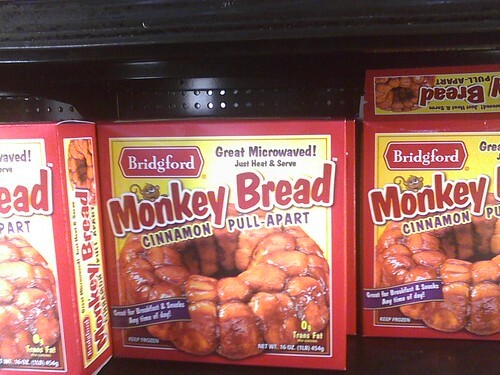 The microwaved monkey bread is funny. Look at how many boxes there are as well...I guess it's in demand? I don't think I'll be dumping a can of spaghetti-o's on a pizza anytime soon, but it was fun to read about.